Kelly and Max fly to Wisconsin to get a free car from Kelly's Mom, then drive back across seven states, encountering the little things that make America so wonderfully strange in this collaborative zine that mixes comics, found objects, and small sections of text, in the best tradition of those in comics who also come from zine culture. Opening with snippets from items they collected along the way--receipts, tourist pamphlets, postcards, and whatnot, we move into Kelly and Max's comics, sharing moments from their adventures, whether it's forgetting it's 9-11, meeting Rob Kirby and his partner, or an overabundance of possibly rabid prairie dogs. There's no attempt to capture everything, nor should there be. This is like sitting down with the pair and hearing the highlights of their adventure, or sharing an old-school slide show (without the boring parts). As a person who traveled from Baltimore to Portland, Oregon several years ago, I found a lot to remember fondly, even though our paths were not the same, and due to having three cats in tow, we were unable to stop anywhere. America is really huge, and when you get outside of the major cities and attractions, there's so many curiosities to discover. This is captured well by Max in a panel of roadside billboards for everything from a car show to an 1880s town to an "American Owned" hotel, showing vague racism is alive and well. When they do make it somewhere, such as the Bible themed encounter, we don't get a lot of details, but Max's linework really sells the visuals and packs a lot into his panels. We can imagine the wider world they've traveled into, such as the greasy spoon diner that hints at a dirty kitchen without showing it. His sections feature heavy shading, panels packed to the gills, and characters whose wide-eyed expressions evoke a very familiar alt-comix experience. On the other hand, Kelly's sections have much more open space, with only so much details as are necessary to set the stage, such as a very basic set of lines to represent a table. Her trees and shrubs are abstracts, and cowboy boots on a rack are capital-Ls. Her figures are no less able to tell you what is going on, but they don't carry the details that Max's do. Side by side, they offer a contrast that's striking, providing you with two very different parts of the indie comics world. Neither is superior to the other, though depending on your taste, you may find yourself more attracted to one style or the other. These are two people sharing their story together, and their visual voices are as a distinct as would be the case if we were all at the bar together, with Kelly and Max alternating the journey. Call it a zine or a mini-comic, depending on what tradition you come from. 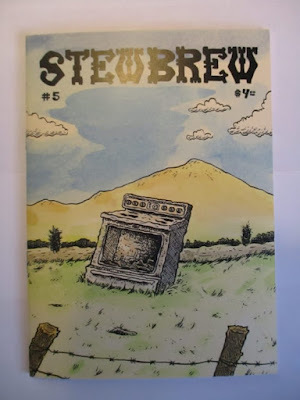 The thing that I like best about Stew Brew #5 is that it's a way for Froh and Clotfelter to share their experience driving across country with you, if you want to come along for the ride. Those who enjoy reading about road trips and keeping up with the events of their friends in comics/zines should plan to join them. There's a lot of fun packed into a small number of pages. 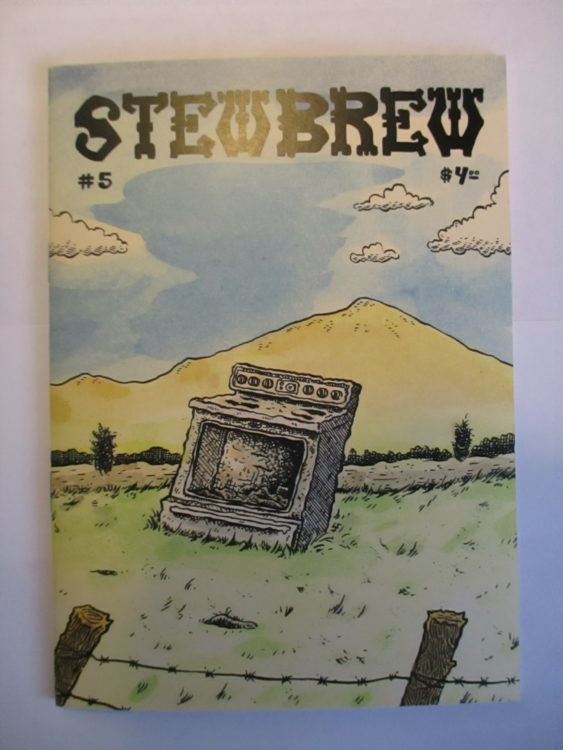 You can purchase Stew Brew #5 here.